Today, it’s with a heavy heart that we announce that smooya will be stepping down from the active line-up, and will be allowed to search for new opportunities from a benched position. 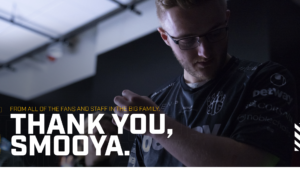 The decision to part ways with smooya was not an easy one, as we have reached incredible heights together, but after careful consideration, we came to the mutual agreement that this is the best move for both parties. Returning to the roster will be Johannes “nex” Maget, who has received medical attention for his wrist pains the past weeks, and is now able to compete again. Fortunately, upon further consultation with his doctors, we learned that surgery isn’t required for his recovery. He will still undergo regular therapy to make sure his wrist remains in a good condition. The presence of nex and his calm and collected attitude was pivotal in the success of our Counter-Strike team, and his return will help immensely in solidifying the team ahead of the Major. Owen has a lot of talent, this was already clear when we picked him up. He played a BIG role during our summer run, including the 2nd place in Cologne and becoming Legends at the FACEIT Major. Not everyone could have dealt with the fast success and playing on stages in front of massive crowds as well as he did. The fans loved him for his emotion, so did we. However, it’s not always easy if you are the only foreigner in a team. We had some different opinions on how to approach the game and team development and it turned out that his and the teams not align. I’m sure that he is a great addition to any top team and I personally and the whole BIG family wishes him all the best in his future endeavors. This may come as a surprise to most people simply because of how happy I’ve been over the last eight months (despite my lack of individual performance). But, I had a long think about not wanting to hold this team back, I think they already have an insane system that just needs a little bit more work and they will become a standout top five team in the world but sadly I don’t think I’ll ever fit into this system simply because of playstyles. There is no bad blood between anybody in the team I just think personally they would be better with another player to do my role as I’ve never really had the MAIN AWP role since being here. Continuing, I’ve never been a weak link in a team and I don’t want to be, when I say that some people may get confused by saying ‘but dude you were so successful and was only improving’ as well as that is true! I had different visions of the environment that would be here for me at BIG in-game. This whole experience was a very positive one overall, I learned more outside of the game than I ever would elsewhere simply because of how cool everyone here at BIG is. We’d like to thank Owen for the time at BIG and wish him all the best in his career. We will be doing our best to help him find a new home that will treat him properly, and provide him with an environment where he can excel. To answer further questions about the team, our Managers Christian Lenz and Nikola “LEGIJA” Ninic will hold an AMA on Monday, 4. February 8 PM CET on his Twitch Channel.